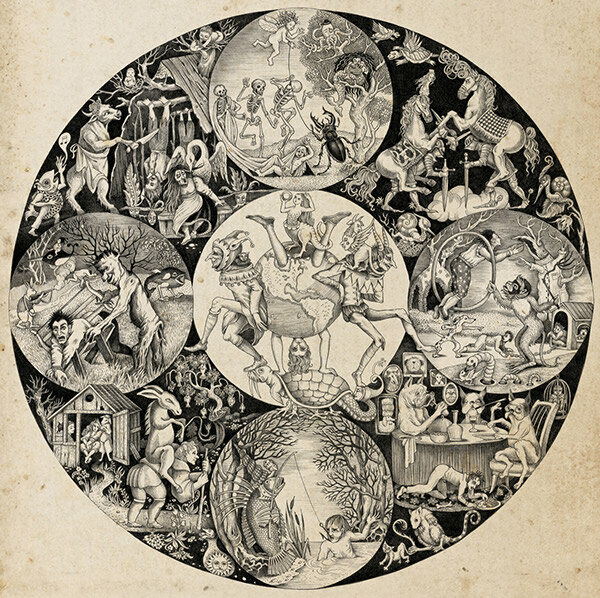 Leave it up to Sveta Dorosheva to once again capture what’s happening in my psyche. This illustration is called Topsy Turvy World. It personifies how I’m feeling right now about the Trump presidency and the palpable fear I have that the laws of our country will soon convert into a living nightmare for myself and so many people I care about. I’m going to come back to that. But first, I want to talk about NaNoWriMo. NaNoWriMo has been an utter failure for me this month. I realized pretty quickly that I couldn’t write the sequel to THE CONTENDERS while taking a break from my novel, SEVEN DUDES DOC AND THE SEVEN. I thought I could, but I can’t. I can’t do this because I like closure. I’m an ENFJ and I really like finishing. Writing a first draft is not closure to me–it’s a beginning, an opening to something much bigger. So, I have to continue. I feel compelled to continue. I need to continue writing SEVEN DUDES DOC AND THE SEVEN until it’s ready to be submitted to my beta readers. Then, and only then, when my draft is as good as I can get it by working on my own, can I even begin to start thinking about working on a new novel. On a happier note to this dreadful week, I am looking forward to reacting to the first draft rather than having to face the blank page and make everything up from scratch. It’s one hundred times easier to rewrite a draft than it is to write the first draft. Other writers might feel the opposite, but for me, rewriting is where it’s at. I begin the second draft today. I think taking time every day to work on my story will be a welcome respite from reality. With the Trump presidency looming, I need to immerse myself in making art. It’s one of the only things keeping me afloat right now. Art will heal me. Art will save me. It always has. The other thing that has saved me time and time again are good people. I give deep thanks to my husband Marcus, and my friends Linda and Brian for helping me grieve and process the horrors of this week. I also want to thank my friend John. John is a straight, white male in his 40s who grew up in rural America. This is what he posted on Facebook after the election, taking the risk that he might lose friends and colleagues by doing so. It’s actions like this that give me hope for a better tomorrow. 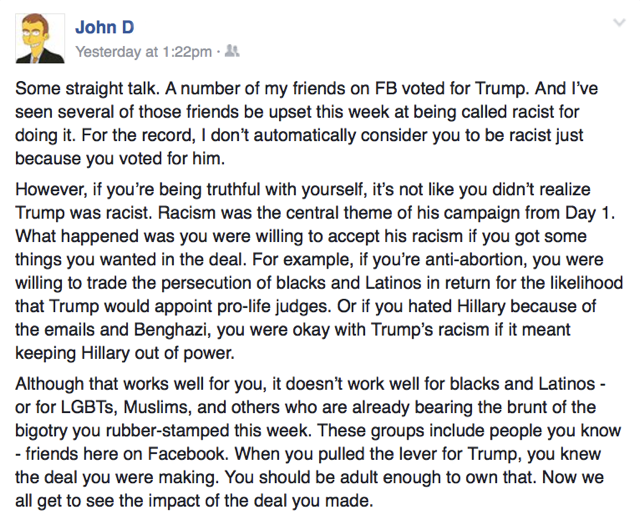 We need more white people like my friend John to stand up and call other white people out for their racism and/or their complicity in supporting racist leaders and policies. We need more white people to take responsibility for supporting and benefiting from white privilege and institutional racism. We need more white people to educate other white people about racism. As I learned through the Undoing Institutional Racism workshops by The People’s Institute Northwest for Survival and Beyond (amazing, educational, life-changing experiences that I highly, highly recommend! ), the minority cannot by itself successfully educate the majority on racism. Members of the majority must step up to educate their peers. It is through an alliance of majority and minority people working together to undo racism that it can actually be undone. In the meantime, I continue to make art to share with the world. I continue to help people. I continue to spread love. I continue.